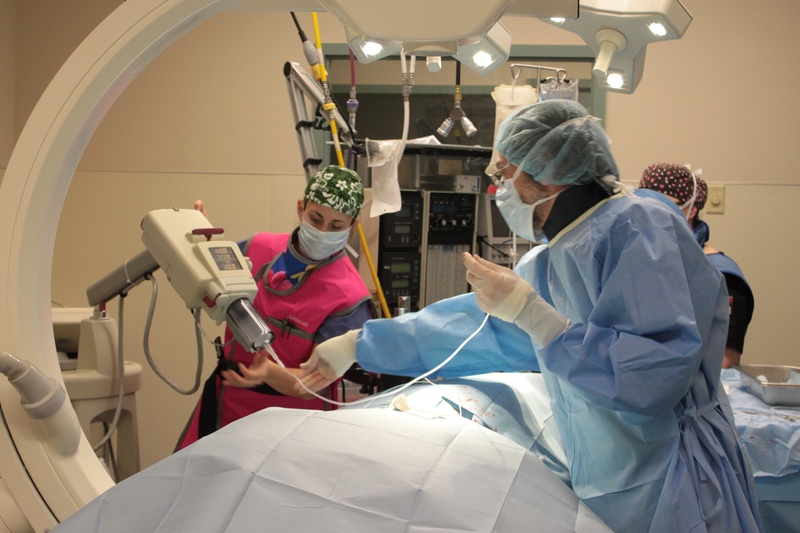 In late November, we held our first invasive cardiology lab here at Canada West. Invasive cardiology involves using diagnostic and therapeutic tools, such as balloons, catheters or stents that are inserted directly into the patient’s body to treat heart disease. They are much less invasive than traditional surgical procedures and can be used to treat animals that would otherwise be forced to travel outside of Canada for effective treatment at greater cost and risk. Hermosa, a 7 month old extremely sweet boxer, was referred to us in September due to a heart murmur she had had since birth. Some breeds are more susceptible to heart conditions and boxers are amongst this group. A heart murmur is caused by abnormal blood flow through the heart. Heart murmurs are graded from 1 to 6, with 6 being the most serious. This murmur was a grade 4/5 out of 6 which is strong enough that you can feel it by placing your hand on the side of the chest. An ultrasound (echocardiogram) revealed that Hermosa had two forms of congenital heart disease. The first involved a thickening of the leaflets of the pulmonic valve, which results in a smaller channel available for the blood to pass from the right side of the heart out through the arteries and lungs. Due to the severity of her condition, if left untreated this would significantly increase Heromosa’s risk over time of going into congestive heart failure or the development of lethal arryhthmias (abnormal heart rythm). The second issue was a a small abnormal “hole” between the right and left ventricle. In Hermosa’s case this defect was considered small and therefore unlikely to cause problems in the future. The procedure for Hermosa consisted of an angiogram and balloon valvuloplasty. 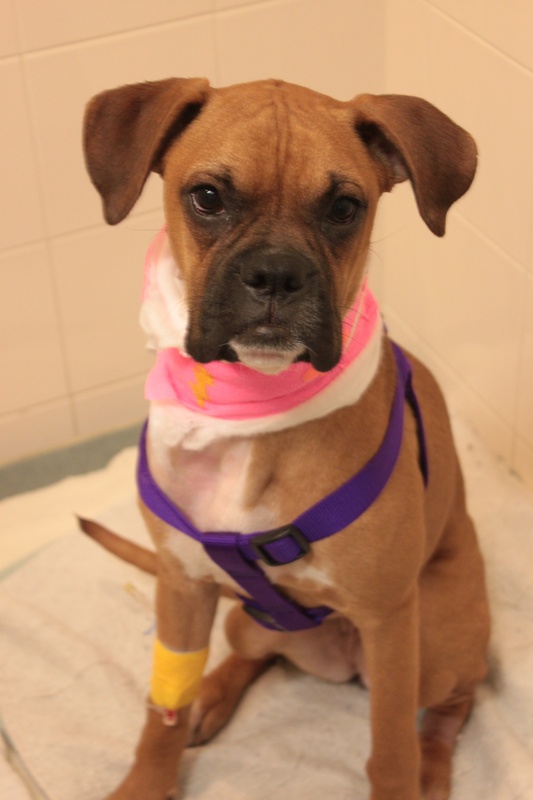 Hermosa recovered very well in our ICU. The incision was very small (about 6 cm) on the right side of her neck. She looked fantastic the next morning and a repeat ultrasound revealed improved blood circulation and indicated the procedure was successful as it had changed the functioning of her defective heart valve. She was sent home the day after the procedure and we will see her again approximately one month post-procedure for a follow-up ultrasound which will give us an even better idea of the overall results.